As a Lion Air crew fought to control their diving Boeing 737 Max, they got help from an off-duty pilot in the cockpit and staved off disaster. The next day, a different crew wasn’t as lucky—investigators said the same malfunction in the same plane doomed all aboard. Since then, another 737 Max crashed under similar circumstances. With hundreds dead and Boeing investigations on four continents, including a U.S. criminal probe, the iconic American aircraft manufacturer is under siege. And airlines who rely on its now-grounded 737 Max are in trouble, too. On Tuesday, we told you the children of Australian billionaire Rupert Murdoch are now billionaires themselves, thanks to Disney's purchase of Fox assets. Now see how thousands of Americans will be fired as a result. Unlike those workers, these men are less likely to worry about collecting unemployment or finding affordable health care: Meet the most exclusive club in the whole world. You only need $100 billion to join. Ford said it will spend $900 million and hire 900 people to build electric and self-driving vehicles in Michigan. Cyclone Idai has deluged Mozambique and Zimbabwe, killing at least 300 people and leaving thousands stranded as rising waters cut off entire communities. There have been a lot of surprises in recent surveys of global health. But when it comes to the world's happiest people, the UN says they live in the social democracies of northern Europe. Obesity is becoming a health crisis in Africa, Kasume Iwase writes in Bloomberg Opinion. What’s Joe Weisenthal thinking about? The Bloomberg news director says a big question is whether the Fed will pivot to target average inflation over the cycle, a move that could indicate a greater willingness to let inflation run hot for a while. Many economists opine that such a signal might end up being a self-fulfilling prophecy. The Fed says no rate hikes for 2019. UBS says the first-quarter was one of its worst in recent history. Amnesty International USA violated labor law, a judge ruled. Ford Explorer owners say their SUVs are making them sick. Theresa May asked the EU for a three-month delay on a Brexit deal. This high-performing hedge fund says buy gold and sell stocks. Grain gluts, Trump's tariffs, floods: U.S. farmers are in crisis. Hermes is casual wear’s latest fashion victim. The Hermes tie has long been the sartorial foghorn announcing the arrival of a wealthy, successful man. Well not anymore, and the French fashion house is suffering. 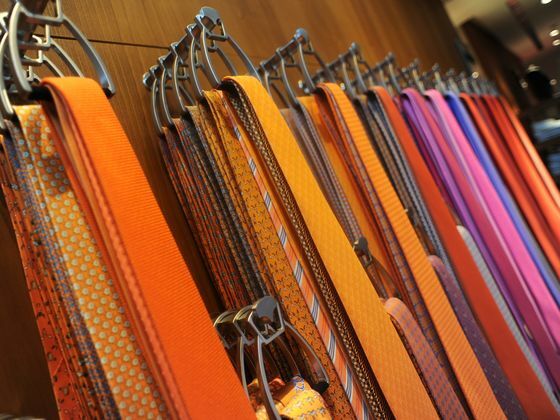 Men just aren’t wearing ties that much anymore, let alone ones that cost $195 a pop.